The XPERIA X1 comes with the standard Windows Media Player, which clearly underperforms. It only manages mp4 and 3gp and for DivX/XviD you will need a third party application. The arc slider does give the display a bit of tilt, but hardly enough to make a great difference for watching videos. The Windows Media player doesn't do too well in the music playing department either. The interface is stylus oriented. Tracks and videos are handled much like in the desktop version. Again, the Media Xperience panel is the way to go. It launches an interface identical to the Media center found on the Sony Ericsson feature phones with a pinch of touch optimization. And as you probably know if you have been keeping track of our recent reviews we really do like this media gallery. For DivX and XviD palyback we resorted to the well-known Core player. The Sony Ericsson XPERIA X1 pleasantly surprised us here by being able to seamlessly play videos at a bit rate of up to 1.46Mb/s. While going any further than this is sure to result in skipped frames, this is a more than good achievement. In comparison, the HTC Touch HD, which has the same display resolution, was only able to handle up to 1.2 Mb/s. The XPERIA result is in fact quite close to the HTC Touch Pro but the latter has a smaller screen with 25% less pixels. So, watching videos is surely another point won for XPERIA X1 over the HTC Touch Pro. Only since recently are Windows Mobile devices considered serious music handsets. Before that their business orientation has served them as a pretty good excuse for the poor audio quality. However, the latest HTC devices were a clear sign that this is about to change. Therefore we were quite eager to understand if the XPERIA is the next step forward on this way. As it turned out the handset has the best frequency response we have ever seen on a mobile handset. 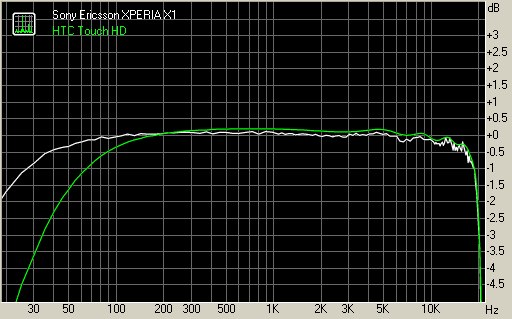 In addition it also achieved superb noise level, dynamic range and stereo crosstalk readings. In fact its results on those are even better than the dedicated Apple iPod music player - how is that for a change? Unfortunately a price had to be paid and that is the rather high total harmonic distortion and intermodulation distortion levels. Nonetheless it seems that there is not too much left before the WinMo devices start to directly compete music-oriented ones. Sony Ericsson XPERIA X1 is equipped with a 3.2 megapixel autofocus camera with a maximum image resolution of 2048x1536 pixels. It also has a LED flash that is supposed to assist night photography but as usually its power is inadequate for producing a decent photo. On the positive side it can also be used as a video light unlike its xenon siblings. Having already checked out the camera performance our advice for you is not to set your expectations about it too high. The main aim of the camera interface appears to be simplicity and it achieves it. Upon startup it displays a large icon (camera or filmstrip) to indicate the selected mode . There are two groups of overlaying controls. In the upper left corner there are indicators for "remaining" images/minutes of video, resolution and the location of saved photos. In video mode there is also an indication of whether the microphone is on. The other group is a vertical toolbar on the right side that allows you to switch between modes - photo, video and playback. When holding the phone in your right hand (as you will most likely do since the shutter is on the right) you can single-handedly toggle camera modes with your thumb. To work with the settings menu though you would need both hands but the layout of touchscreen controls is quite ergonomic. Navigating with the track pad is almost as easy. At the bottom is the Settings button. Pressing it reveals another vertical bar, this time on the left. It has four buttons - Scenes, Focus, Flash and Shoot mode. The appearance of each of those four buttons changes any time you select a specific setting, so you know which one is being used. These however are the basic settings. Another press on the settings button will bring up the advanced options. You can change resolution, color effects etc. This menu is not so thumb-friendly but you don't necessarily need the stylus, the track pad does just fine. Focusing is done by half pressing the shutter key. If touch focus is enabled you can move the focus point by touching any part of the screen with your bare finger. The image quality of Sony Ericsson XPERIA X1 isn't quite as impressive as we hoped. The phone fails to resolve enough detail in photos and dynamic range seems too low even in phone terms. As a result, highlight clipping is quite a common sight on the photos produced by the handset. Noise levels are also quite high and probably you should've got the idea by now that this isn't the best camera on a mobile phone we have seen. At least the colors are rather precise on most occasions and if you steer clear of scenes that are too challenging for the dynamic range, things could look pretty decent. At least the video recording capabilities of the XPERIA X1 seem more promising than the still camera. VGA resolution at 30 fps sounds really sweet and is quite adequate for almost any purpose you can think of. In fact, this may as well be the first PocketPC to offer that kind of video recording. However, the image quality is not as pleasing as it sounds - the XPERIA X1 video falls short of what some other VGA recording phones can offer. Most surprisingly our retail XPERIA X1 records in the inferior 3gp format. Here is a quick comparison between it and the Nokia N82 so you can best see the difference.